Although there is the old saying that you should never discuss politics or religion at the dinner table, I personally find these topics (along with Spirituality) far too interesting to avoid and I’ve rarely followed this guideline. The theory behind this phrase is, of course, that these subjects have huge potential to cause conflict, and conflict can drain us and cause us to lose friends (or maybe worse), but if we avoid the topics completely, we will surely miss out on vital information that others have to share. We evolve as a species when we share our resources, and Information is one of the resources that we have to share. Hearing the learnings of others may challenge our own belief system, but this is good as it forces us to consider our positions deeply – even if we don’t agree with our counterparts after the debate. To avoid the subjects completely is the answer of an ostrich, but as conflict isn’t something we wish to encourage, we must tread carefully when we head out in these directions, ensuring we are centered before we spout our truth. Peace, not conflict is the aim of the game. We must voice our beliefs when appropriate to do so. It’s also worth keeping in mind that you cannot look to others for the answers to your own questions, nor expect that they will be bothered about helping you to find your answers or hearing your beliefs. Everyone has their own questions which they must answer first. Everyone sees the world from their own perspective and they will not give one iota for you trying to give them an answer to a question they didn’t pose. You must trust that when the student is ready, the teacher will appear. One person cannot be everyone’s teacher, for we all learn differently and are all here to learn different things. As we each carry a unique set of information, we must trust that Synchronicity will ensure the right people will arrive to pass on information exactly when it is required – we must not spout our opinions as the result of our own restless energy or need to be heard. In ‘The Longer Now’ chapter of The Celestine Prophecy, we are encouraged to look at history to view how our species has evolved and to understand why so many of us experience restless energy in current times. But once we have lived through a level of spiritual awakening, the pace of change around us can sometimes seem all too slow in developing. We see the Earth being abused, we see people living under hardship and oppression, and we believe we must evolve as an enlightened species to save the planet – this itself can lead some restless souls into believing they must shout their learnings from the rooftops to help speed things up. The only problem is that as some of their audience never asked to hear them speak, the learnings shouted can cause irritation and drain the energy of those who are expected to listen – provoking drama in even the most placid souls. We must ensure when we voice our opinions, we are not being indulgent in the belief that Synchronicity is leading us to a place where we can spout our truth and that someone will find it useful. Maybe the odd person will gain something out of an impromptu lecture, but if the audience didn’t invite the teacher, it’s likely that conflict will arise. 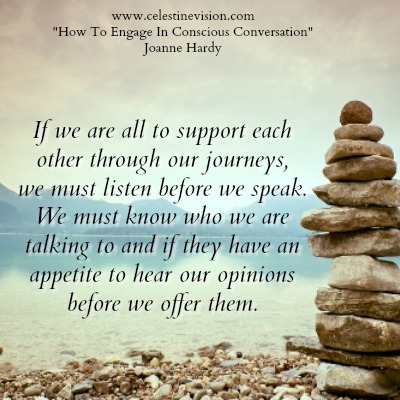 If we are all to support each other through our journeys, we must listen before we speak. We must seek to intuit who we are talking to and if they have an appetite to hear our opinions before we offer them. We must be respectful of the group dynamics we enter and be aware of how much space our own narrative consumes – to take too much becomes self-indulgent, yet to give too little means others will miss out on the information that we have to share. Carry the attitude of expecting Synchronicity all the way into the conversation. Synchronistic Flow feels as though you are slowing down and that you are the center of your own unfolding movie – keep this centered clarity and you’ll know what to say. Commit to holding your truth, including all the ideas that come up intuitively to say, even if you’ve never thought of them before. 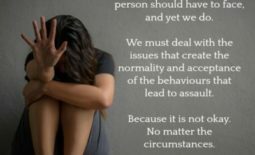 You don’t need to defend yourself or to convince anybody of anything, just share the truth of the situation as you see it, without needing the other person to agree with you. Above all, hear the other person’s truth and consider it, it might be a learning moment. 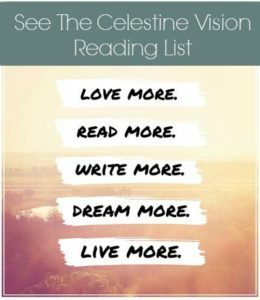 To be kept up to date with upcoming Celestine initiatives and volunteer opportunities, subscribe to our newsletter here.